Japan’s Ministry of Economy, Trade and Industry (METI) has released the new Feed-in Tariffs (FiT) scheme for renewable energy resources for fiscal year 2017. The FiT rates for solar PV systems will be reduced as planned with a reduction rate above all other resources. Residential PV systems with capacity under 10kW will receive FiT subsidy for 10 years, other types will receive subsidies for 20 year. Besides, non-residential PV systems with capacity above 2MW shall be arranged through solar tenders since October 2017 with bid price up from 21 yen/kWh, 2017’s FiT rate for non-residential PV systems. As for PV projects that have filed while been unable to interconnect, METI requires PV projects that applied for grid connection after August 1, 2016 to finish interconnection within three years, or METI will cancel FiT subsidy by month. 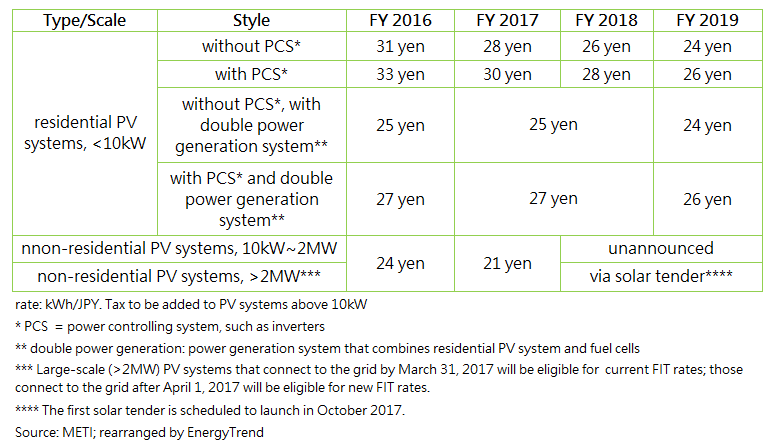 For onshore wind power systems with capacity above 20kW, the FiT rate will be reduced from 22 yen/kWh to 21 yen/kWh since September 2017. FiT scheme for hydropower system with capacity of 1~5MW will be increased from 24 yen/kWh to 27 yen/kWh. Biomass generation systems above 20MW will receive FiT subsidy of 21 yen/kWh since September 2017, lower than current’s 24 yen/kWh; on the contrary, biomass systems below 20MW will still enjoy a subsidy rate of 24 yen/kWh. FiT scheme for traditional geothermal power generations will not be changed until fiscal year 2019. Meanwhile, METI adds new FiT schemes for geothermal power projects using innovate, different facilities. It is noticeable that FiT reduction ratio of PV systems is larger than other renewable segments. METI notes, Japanese government has arranged up to 3.7~4 trillion yen budget for renewable energy FiT scheme in order to increase their capacity share to 22~24% by 2030. By the end of 2017, the budget will be consumed over a half. Japan’s nationwide electricity tax rate has also been revealed along with the new FiT scheme. For fiscal year 2017, electricity bill for home-use will charge 2.64 yen/kWh as electricity tax. The average annual tax payment will be 8,233 yen for each household, calculating through average month power consumption of 260kWh of a conventional Japanese family. The average tax payment is lower than 2016’s 9,504 yen each family. The electricity tax is calculated according to FiT subsidies, electricity fed into the power grid, and other related financial figures.